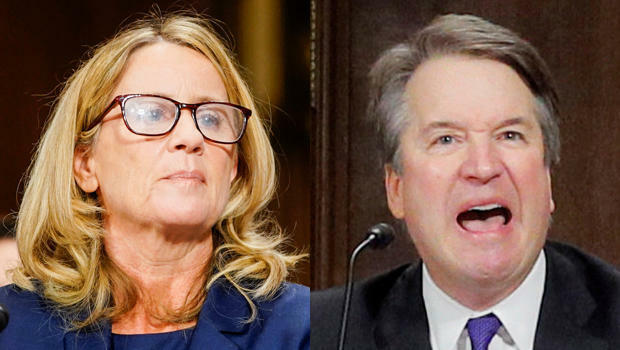 If you watched the testimony of Christine Blasey Ford and Supreme Court nominee Brett Kavanaugh on Thursday, you might have noticed that the two expressed themselves differently. Blasey Ford, a professor of psychology, spoke carefully and clearly as she told the Senate Judiciary Committee about being assaulted by Kavanaugh back in high school. Blasey Ford’s voice was measured and polite; it cracked, but she did not weep, she did not yell. She was solicitous, deferential. The story she told was awful, from the alleged assault itself, to being brought forward into a national spotlight against her will, to the hatred she and her family have incurred since landing in that spotlight. She had every reason to be impassioned, angry. But women are taught early that if we express anger, we will not be taken seriously. We will sound “childlike,” “emotional,” “unhinged,” “hysterical.” And so, many of us take immense care not to express our anger, lest we undercut the very point we want to make. The fury of powerful white men is heard differently in this country, always has been. We admire the rage of our country’s Founders: Give me liberty or give me death! It’s not just that white men are allowed to be angry and women are not; it’s that white men’s anger can be used to their benefit. And so, when Brett Kavanaugh spoke on his own behalf, he yelled; he wept furious tears; he challenged and berated members of the judiciary committee. As I listened, I understood that this approach might well bolster Kavanaugh’s case. That’s because we reflexively understand the anger of white men (especially when used to convey how unfairly they’ve been treated) as righteous and correct. So, if Brett Kavanaugh is ultimately confirmed to the Supreme Court, remember that he had at hand a tool, a weapon of self-defense that has never been offered women: He could be angry on his own behalf.